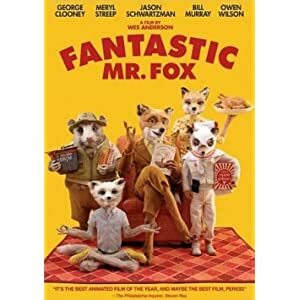 A review of Fantastic Mr. Fox on DVD and Blu-Ray, you say? But, they came out over a month ago! Well played, reader. But, we need to do a review. We promised. 2) The regular DVD version is comparatively bare-bones. It includes “From Script to Screen,” “Still Life (Puppet Animation),” and “A Beginner’s Guide to Whack-Bat.” The Blu-Ray set also includes “Making Mr. Fox Fantastic,” “The Look of Fantastic Mr Fox,” “The Cast,” “Bill and His Badger,” and “Fantastic Mr. Fox: The World of Roald Dahl.” These bonus features are similar to, but more extensive than (please share your thoughts), the well-done online documentaries. But, they are absolutely worth having, and it is too bad that the regular DVD disc only includes a few of them. 3) The transfer is absolutely stunning. 4) Minor complaints: the menus are a bore; the layer change comes at an awkward point; and, the “Guide to Whack-bat” is rather useless. Once we have The Darjeeling Limited Criterion-ized, we will start our Fantastic Mr. Fox campaign. Previous PostPrevious A Fantastic birthday!